Pet owners and veterinarians have reported Lyme, Ehrlichiosis, Anaplasma, and tick paralysis in dogs, cats, horses, sheep, and goats. Just as with humans, it is important for animals to avoid tick bites and receive prompt treatments for Lyme and other tick-borne illnesses. Anaplasma - High fever, joint pain, lethargy, vomiting, diarrhea. Babesiosis - Lethargy, appetite loss, weakness, pale gums. Rocky Mountain Spotted Fever - Loss of appetite, fever, depression, pain in muscles & joints, swollen lymph nodes, and fluid accumulation in arms and legs. Dogs can also have dizziness, seizures and stupor. Hemorrhages in the eyes can develop and may have blood in stool or nose bleeds. Symptoms typically present 2-14 days after tick bite (from dog tick). Bartonella vinsonii - Lethargy, weight loss, fever, weakness, and poor appetite. Less common signs include nasal discharge, bloody nose, coughing, lymph node enlargement, neurological issues, lameness, diarrhea, and vomiting. Canine Ehrlichiosis - Fever, muscle aches, runny eyes and nose, loss of appetite, swollen lymph glands. Lyme Disease - Lameness, swollen joints, fever, poor appetite, fatigue, and vomiting (some infected animals show no symptoms). Tick paralysis in dogs - Gradual paralysis, seen first as an unsteady gait from uncoordinated back legs (some infected dogs don't develop paralysis). Fever, arthritis, loss of appetite, fatigue, eye problems, breathing disorders, heart disorders, "trance-like" state, and possible sudden collapse. Arthritis (displayed as joint pain, swelling, stiffness, shifting from foot to foot, and lameness), fever, and weight loss. Arthritis (stiffness and swelling in large joints and shifting from foot to foot), loss of appetite, and neurological disorders (behavioral changes). When walking or exercising your outdoor pet, try to keep it away from grassy or wooded areas and leafy debris. Check your pet regularly for ticks, especially after trips through grassy or wooded areas. Comb through your pet's hair thoroughly. If you find a tick remove it promptly. 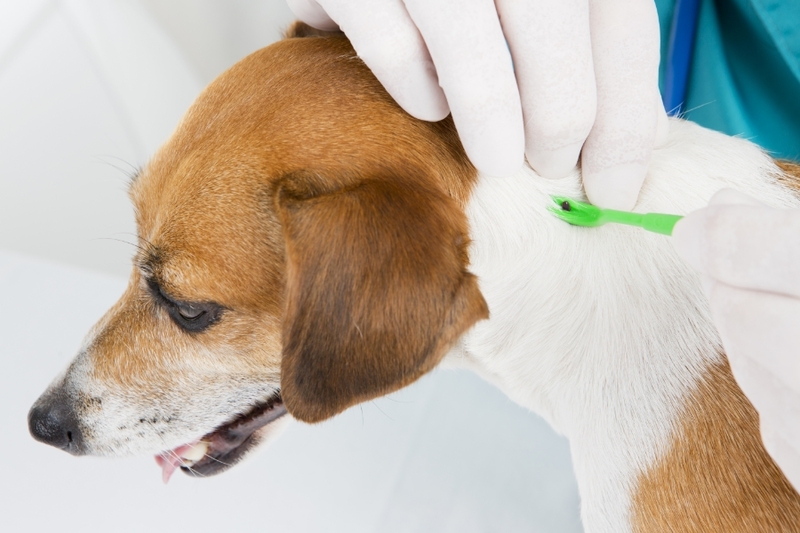 Consult your veterinarian about the Lyme Disease vaccine for your dog. Consult your veterinarian about treating your dog with tick-killing pesticides (acaricides) or using tick collars. If you find several ticks on your dog, you may wish to discuss an insecticidal bath with your veterinarian or groomer.